A very satisfying romantic comedy about wealth and gold digging, Priceless is an amusing confection of sprightly energy and winning charm. Just like the main character, Priceless is deliciously naughty and amoral, but always immensely enjoyable. The captivating Irène enjoys the high life, especially when a man of wealth is paying for it. With her abundance of charms and feminine wiles, she’s armed for digging for gold wherever she can find it. Frequenting the French Riviera with her latest conquest who is boring her, she encounters put upon bartender Jean one evening. The amusing thing is Irène assumes he is a rich man of the world by his appearance. Not telling her the truth, Jean and her share drinks and laughs. Later, things are taken to the bedroom. In the morning, Irène has left and Jean is left thinking of her. A year later, Irène returns to the hotel with her sugar daddy in tow, where she promptly seduces Jean once more. Only this time, Jean gets busted and the truth of his status is revealed. This coincides with Irène’s latest squeeze leaving her with nothing money wise and jilting her quickly. A shocked Irène high tails it to Nice, not realising how smitten Jean is with her. Instead of just forgetting her, Jean finds her and attempts to woo her. takes full advantage of this as her expensive tastes nearly bankrupt the far from affluent Jean. Panicking when his finances are tight, Jean is saved by wealthy widow Madeleine. She has been looking for a new toy boy and Jean fits that bill. Surprisingly, Jean finds he has a knack for gold digging too, with the main objective being to romance Irène in the end . Irène is quite impressed by this show of initiative and offers help in the business she is well acquainted with. Transformed from hapless bar tender to jet set smooth talker, he even begins rivaling her at the game of money. Seeing how successful he has got , Irène comes to see Jean in a new light, which puts her plans for finding another rich man in jeopardy as her personal feelings enter the picture. Pierre Salvadori is in the director’s seat for this frothy and charming comedy. He knows the way to keep events bright and breezy, before colouring them with a bit more depth than most romantic comedies strive to reach for. His eye for humour and timing, most notably in Jean’s attempts to be seen as a prospect to the girl he loves is what really gets the most laughs. The scenario of the film is hardly what one would call groundbreaking, but enjoyment is the name of the game and Priceless rises to the occasion admirably. Depending on your tolerance level, you’ll find Priceless irresistible or too arch. For me, I fell into the former camp by miles. It’s the old-fashioned vibe and nods to romantic comedies of yesteryear that Priceless excels at emulating, and giving it a bit more than the average modern Hollywood rom coms that we are witness too. What you get here is riotous fun that also stops to consider why Irène would go on the path of a gold digger in the first place. A nice depth arises from that strand of story that definitely caught my attention. As a movie that deals with the rich and well-heeled, Priceless looks gorgeous, supplying us with picturesque and chic views of the French Riviera. Trust me, you may be considering holiday plans after watching Priceless. The extravagance on show and just the overall seductive view of the rich life is swoon worthy. A sparkling and amusingly jaunty score accompanies the film with effusive energy and playful rhythm. The talented Audrey Tautou supplies slyness, allure and even a bit of desperation as the material girl everything revolves around. Irène is someone who clearly has a plan to snare someone rich and enjoy the high life at the same time. Tautou makes Irène a minx but not one that is completely unlikable. Sure she goes after men’s wallets more than their hearts and practically obliterates most of Jean’s income in the beginning, but with Audrey Tautou the beguiling persona and glimpses of someone not wanting to fall by the wayside are felt by the audience. Gad Elmaleh is blessed with a sad-eyed expression and certain lugubrious charm to make the part of Jean work. Jean is something of an unlikely gigolo, which is a strength Gad Elmaleh and his lanky appear de play to masterfully. Elmaleh like he’s having fun as the love struck man pursuing the woman who captured his heart and trying to play her at her own game. The enjoyment factor from both him and Tautou transfers to the audience, paying great dividends. Marie-Christine Adam appears as the glamorous widow attracted to Jean, and though the role is more than a tad underwritten, she possesses the elegance and worldly appeal of a successful older woman. It’s not the most sparkling brand new formula for a romantic comedy, yet the very nature of romantic comedy is to recycle, preferably with style. Which is what Priceless does, with witty aplomb and hilarious high jinks between two potential lovers on the make. With Audrey Tautou and Gad Elmaleh making a fun couple, you can’t really ask for more enjoyment because it’s a frothy and sweet movie that will make you laugh and smile. A harrowing account of a mother trying to protect her daughter in the dark days of World War II, Two Women is strikingly told and excellently acted. 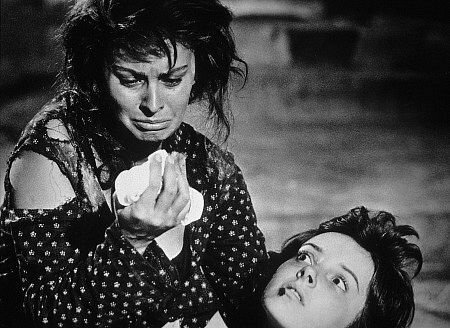 Occasionally it gets a bit meandering, but the grim power and authentically moving performance from Sophia Loren make Two Women a must see. It is the Second World War and in Rome, widowed shopkeeper Cesira is struggling to cope with the constant uncertainty and bombings that terrify everyone. Her main priority is keeping her 12-year-old daughter Rosetta safe, no matter what. Having saved up some money and collected what she needs, she heads with Rosetta to the hills of her childhood, looking for sanctuary. The journey to the hills is fraught with difficulties and horror, but the two persevering women carry on. Once in the poor but a lot more sheltered regional village of her past, Cesira attempts to carve a life for her and Rosetta until the war calms down and they can return to Rome. Along the way, Cesira becomes attracted to young idealist Michele, who also harbours romance for her. Though she develops feelings for him over time, her primary concern is Rosetta and Cesira knows that her impressionable daughter has a crush on him. Times are tough due to shortage of supplies and amenities, though resourceful Cesira tries to make the best of things by foraging food and just protecting her daughter from the horrors of war as long as she possibly can. Yet just as it seems safe for Cesira and Rosetta to return to Rome with the war seemingly hitting a turning point, they encounter brutal tragedy at the hands of Moroccan soldiers. 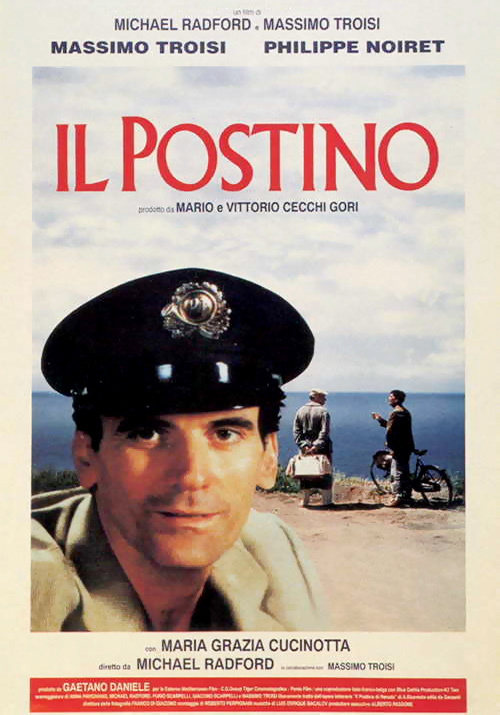 Vittorio De Sica wisely brings his credentials as a purveyor of neo-realism out here, highlighting the stark and unforgiving fallout war can cause and especially on those left behind. 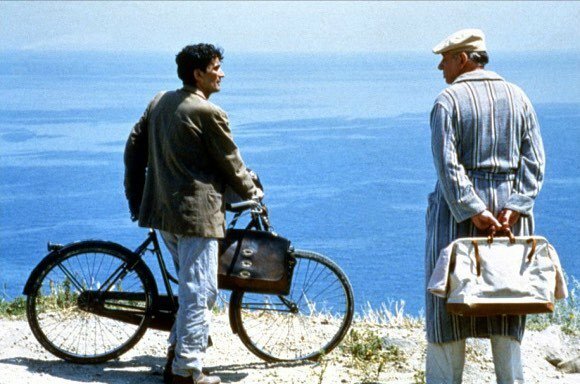 None of the film is varnished or dressed up to look smooth, it is depicted with astonishing naturalness and harsh reality thanks to De Sica’s expertise. It deftly captures the way that a war can impact on people and their lives, one minute it seems calm, the next minutes it is a mass upheaval. There are those out there that will dismiss the film as overly episodic, but by and large, it’s an honest picture of the sea saw of terror and not knowing when . Two Women is not without nicer moments of people attempting to raise their spirits, but these are coupled with scenes of shock and grit that never lets us forget that this is only a temporary respite from a difficult time. Some parts do feel a bit rushed and there are parts that linger too long for their own good, yet the bigger picture and power of the piece always manages to bring it all back to something exceptionally genuine. The last half especially will emotionally devastate and shock viewers with its intensity and raw, visceral content that leaves a mark. The black and white cinematography highlights the bleakness of war and what it does to people, both emotionally and physically. If Two Women had been in colour, a lot of the impact would have dissipated. Music is employed sparingly but appropriately, allowing the main story and themes of survival to flourish but also give an emotional pull when required. 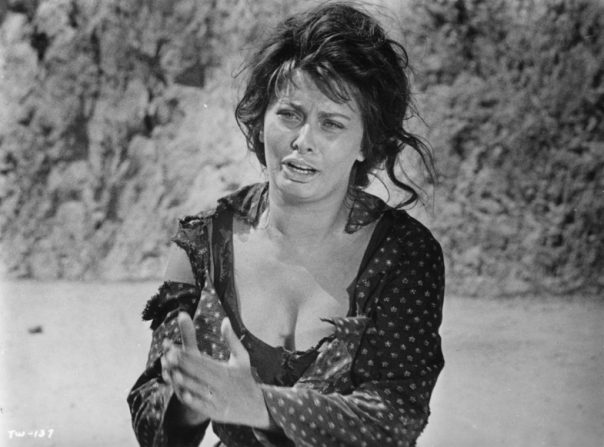 Sophia Loren is simply put powerful and forceful in the lead role; it’s no surprise she won the Academy Award for her raw and heart-rending work here. The role of Cesira is embodied so naturally and with grave, hard-working determination by Loren that you can’t tear yourself away from the screen. She excels at colouring the role with the deep maternal instinct and love, without resorting to melodrama and needless overdramatising. Sure Cesira says what she thinks and can be very feisty, but in the hands of Loren, we glimpse the little nuances of the character that complete the whole. We get many sides to the woman; the caring side, desolation and vulnerability, along with an outspoken attitude and unwavering strength that all make it a triumph of intensity and authenticity. From the first moment you see Loren cradling her daughter from harm and screaming that she wishes the war would end, you just know that the performance is going to be something special. Before this film, Sophia Loren had largely been cast in parts that were merely glamorous and weren’t ones that showcased the talent she had. She really showed off her abilities with this award collecting part, that will haunt the mind for days to come and established herself as an actress to be reckoned with. Eleonora Brown forges a realistic and convincing bond with Loren as the young innocent daughter, whose experiences leave her shell-shocked and she has to grow up quicker than expected. This tender relationship is the heart of the movie and is played magnificently. 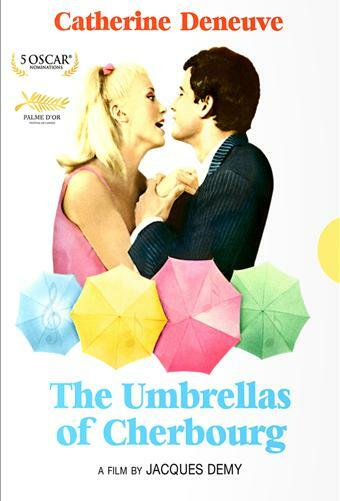 Jean-Paul Belmondo has probably the least demanding role of the central three, but nonetheless conveys the free thinking and opinionated feelings of the young idealist. 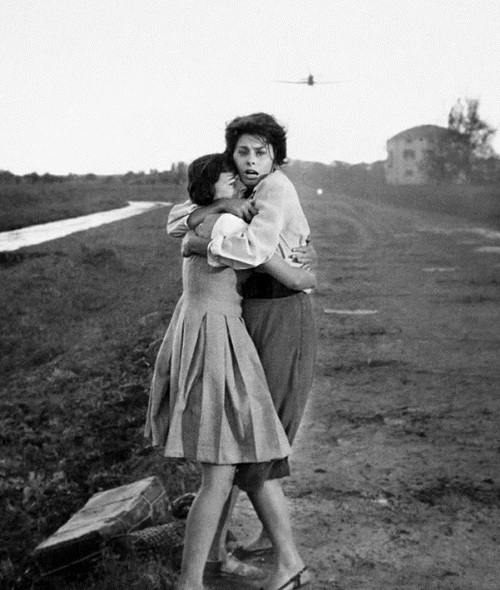 Anchored by the superb work of Sophia Loren showing her mettle and the honest direction of Vittorio De Sica , Two Women is a dark and stark evocation of the horrors endured in World War II and the power of a mother’s love. An audacious melding of more genres that you can shake a stick at and Taking basis from tales of an alleged beast in the of France, Brotherhood of the Wolf is enthralling and unusual in the best sense of the word. Gans is an adventurous film maker it must be said and that puckish quality is put to phenomenal use in this bricolage film, that always has a kinetic feel to it. There is no shortage of drama or eventfulness in Brotherhood of the Wolf that ranks it very high on the excitement and swashbuckling action. From the standpoint of visuals, the movie is so alive and a lot of careful craftsmanship has gone into the sets, costumes and overall atmosphere. The editing conjures up a sweeping and adventurous spell, complete with clever dissolves and overlapping imagery for maximum impact. While it could be accused of over egging the pudding with the sheer amount of genres at work, Brotherhood of the Wolf is nothing short of high entertainment and the very fact that it is so unusual is what makes it strong. Half of the fun in the movie is trying to see what will happen next or what tone it will adopt, which is exemplary in my book. I mean you just look over how many elements the film juggles and your mind is blown. You’ve got the feelings of fantasy and horror through the bloodshed and peculiar nature of the beast( which for a long time is effectively shrouded in shadows before revealing itself). Action is frequently shot like that of a spinning martial arts movie, specially prevalent whenever is around. And obviously there is something historical in the film from the fact that the material of The Beast of Gévaudan is still something of a strange mystery. For many, Brotherhood of the Wolf may confound with the sheer amount of things going on in it. But wouldn’t you rather have a film that is filled to the rafters with content instead of a movie where noting of much value unfolds? The music bursts with unbridled energy from the very first frame. You couldn’t have asked for a better score to match the devilishly blended cavalcade of events going on. Samuel Le Bihan is a good fit for the thinking and slightly rakish Fronsac, who knows something is very amiss in this affair. He gets across the funny and intellectual side that slowly paves the way for a personal streak of vengeance and fury, as the mission grows to be something personal. The morphing from thinker to full on fighter is handsomely handled by Le Bihan. The mainly silent but intense Mark Dacascos lends a spiritual and physical grace to Mani, from his movements to his mannerisms that are largely quiet but when needed pronounced. Dacascos possesses an unearthly poise and athleticism that make the role of Mani one of action as well as soulfulness. Young Jérémie Renier is suitably as the youth who becomes enraptured and curious in helping the two men in their discovery. It helps that has a charm and impressionable wide-eyed expression that is appealing and endearing. The three main guys of the picture work well with each other, obviously bouncing off the difference in personalities and attitudes that are brought together. A demure Émilie Dequenne handles the part of a stifled lady of prominence, who silently chafes at what is expected of her and is more than just an obedient observer when the occasion calls for it. Vincent Cassel nails the sneering arrogance of the warped nobleman whose desire for his sister causes a lot of creepy conflict, especially with Fronsac. 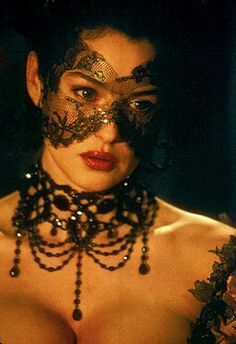 Monica Bellucci seductively steams the screen up as the most mysterious lady of the night, who may very well have more answers than she gives out. Sly and capricious spring to mind when talking of her character and the stunning Bellucci plays that to the hilt. 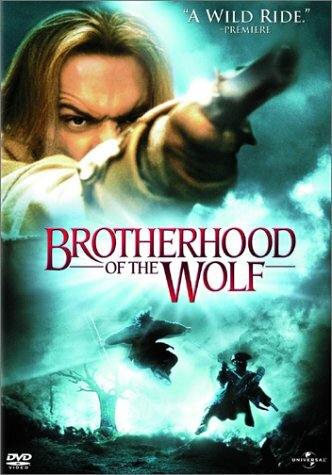 A hugely exhilarating motion picture with deep imagination and a clear love of pulling things that shouldn’t really go together into something spectacular, Brotherhood of the Wolf is one of the most unconventional movies you’re likely to see, but that is what causes it to be so arresting. A stylised and brutal film that also manages to be beautiful at times, Lady Snowblood is quite the experience as the title character slashes her way for retribution. 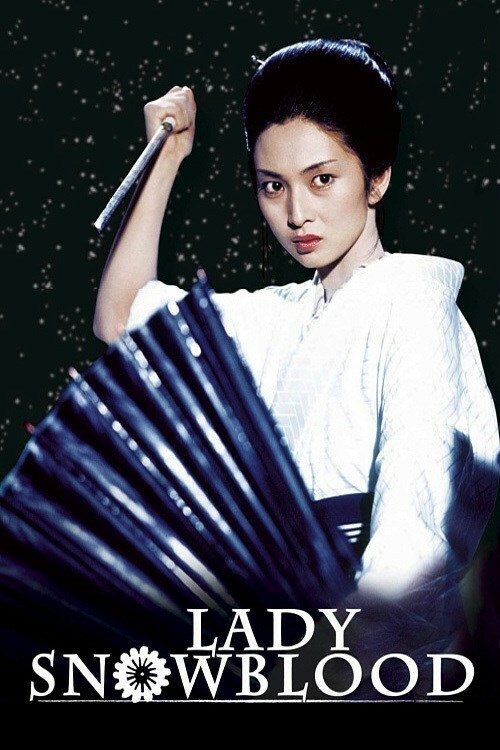 A film that had a huge influence on Kill Bill, Lady Snowblood stands very well on its own feet as an eventful and arresting Japanese action/ revenge thriller, based on a popular manga series. We open with a baby girl being born in a prison to a mother who speaks of her being an instrument for vengeance. She dies shortly after, and the baby who is named Yuki, is raised by a guard and a master. The vengeance her mother spoke of relates to a past event in which her husband was murdered and she was raped by a group of four criminals. Her mother killed one of the group and was sentenced to life in prison. Conceiving a child, knowing that it will one day deal out retribution, Yuki was created for this purpose that will be hers from birth. Yuki is trained to become a warrior as a young child by her skilled master, knowing that as she grows older, her destiny of retribution beckons. Turning 20 and with the Meiji Era upon everyone, beautiful Yuki starts her bloodthirsty quest. She manages to locate people through contacts and her quiet unassuming demeanor, that covers her grasping rage that is concealed much like the katana in her umbrella. The taking down of all of these corrupt and villainous people is going to be anything but simple, yet Yuki is completely focused and nothing is going to get in the way of her goal and what she was created for. Along the way she meets Ryūrei Ashio, a writer who documents her story( naming her Lady Snowblood) as it gathers momentum and Yuki eliminates the criminals who destroyed her mother, one by one. Toshiya Fujita is an impressive and dazzling director, whose approach to the material brings out how dynamic the various threads of genres it covers, as they are pulled together for a memorable movie. Fujita’s largest achievement and asset in his weaponry is his spectacular eye for using the camera in so many unique ways. Jump cuts, point of view shots and a collection of gorgeous swirling zooms are just some of keen stylistic choices that leave you with your mouth wide open. Taking the nonlinear avenue was an inspired choice that pays dividends as we slowly gain information about Yuki, her past and purpose that don’t for a minute feel distracting. The film could have easily become a jumbled mess, but the use of narration and techniques make certain that the nuggets of knowledge we gain are not just overly filler and actually means something to the plot. While Lady Snowblood is a very violent film with geysers of blood at almost every turn, it strangely becomes serene and breathtaking, even in moments of horror and bloodshed. This is largely down to the striking colour scheme and cinematography( largely consisting of red and white) that memorably mirrors the heroine at the centre, who is very beautiful but capable of vengeance for which she was born for and executes with extreme prejudice. The choreography of the fight scenes is handled with a balletic poise and nimbleness, wonderfully realised in blood-soaked glory through the aforementioned multitude of camera techniques and visuals. Yet although the revenge and violence of the piece draws the attention, Lady Snowblood masterfully allows a commentary of a changing time to seep in. The setting is the Meiji era, where Western ideals where becoming popular in place of tradition in Japan, leading to some unrest that the film depicts at a lot of points. It is a great detail in the film as it clearly has more on its mind than just hack and slash, which is kept on an even keel with aplomb and enough entertainment to supply both. And a genuine unpredictability to parts of the narrative keeps the film bubbling on with surprising elegance amid the savagery. Music wise, Lady Snowblood takes many paths, further heaping the disparate influences it has on everything. 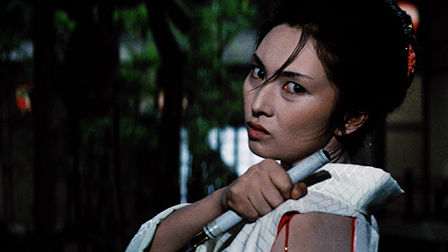 Meiko Kaji spearheads the movie as the eponymous warrior, whose piercing stare along is enough to do damage. Kaji uses her glacial beauty and combines it with a supple grace and almost unearthly stillness that makes Yuki a beautiful but fearsome character. The character is not without compassion, but the biggest highlight of her is her will and vengeance that are embodied strikingly by Kaji with alarming intensity. The sheer amount of rage that Meiko Kaji projects through her eyes is striking and at times frightening, you won’t forget her intense orbs as they burn across the screen with a searing amount of ferocity. Toshio Kurosawa impresses as the writer who tells Yuki’s story and may have a secret to hide. The three actors playing principal villains of the piece, Eiji Okada, Sanae Nakahara and Noboru Nakaya all convey nastiness and gleeful evil to a very successful degree. Everyone is fine in their roles, but it is Meiko Kaji that retains the largest impact as the mistress of retribution and revenge. 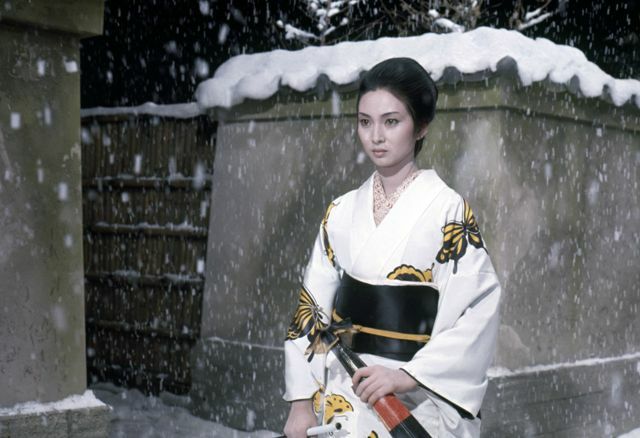 A highly influential film that boasts beauty and barbarism in quick succession, Lady Snowblood stands as a compelling film of style and substance. An arresting and affecting film that deservedly claimed the Best Foreign Language Film Oscar, A Separation is a very intimate and realistically powerful movie from Iran, that is very relatable and surprising in the best possible way. Having heard so much praise for the film upon release, I can know say having watched it that is worth every ounce of acclaim it was accorded. In Tehran, Simin files for divorce from her husband Nader, as they both want different things. Simin wants a divorce and to leave Iran with the couple’s 11-year-old daughter Termeh for better opportunities, while Nader wishes to stay out of obligation to his elderly father, who is declining in health due to Alzheimer’s. Simin is refused divorce as neither parent can agree, so she moves out for a while. Young and very smart Termeh stays with her father, who is struggling to look after his father and the condition he is in. Termeh hopes that by staying with her father, it will ensure that her mother will come back. With his wife not there, Nader needs someone to look after the house and also his father. Being a bank worker who can’t always be at the house, Nader hires Razieh, a poor woman to take care of his father while he is out of the house. She is actually pregnant and needs to money as her husband was thrown out of a job, but her pregnancy isn’t that noticeable to many. And as Razieh is a timid and very devout woman along with being four months pregnant, it stops her from fulfilling her job of caregiver to the best of her abilities. When Nader returns home one day and discovers his father having collapsed with Razieh nowhere to be found, he gets angry. When Razieh returns, he berates her for leaving his father and shoves her out of his apartment. Events take a dark turn when Razieh suffers a miscarriage and claims that when shoved her, she fell and this lead to her tragedy. Her hot-tempered husband Hodjat argues with Nader and everyone is dragged into this battle of truth and acceptability, even drawing Simin back to help her estranged. Tensions begin to hit boiling point as more accusations are thrown about and the accountability of everyone is called into question, complete with threats. At the centre, Nader and Simin are forced to confront their relationship and the impact it has had on everything that followed. Asghar Farhadi is the masterful man behind the camera(as well as the script) and his intelligent, thoughtful and tightly woven narrative is absolutely compelling from the opening shot. He constructs A Separation to be a complex film that covers many intriguing themes like gender, resentment and culpability, and he allows us to witness it play out with revealing and moving clarity. Farhadi’s penetrating and perceptive script moves the story along at a riveting pace that allows for the gradual tension among the players in the story, whose lives are irrevocably altered by the choices they make and their feelings. Although an Iranian film that sheds light on life there in various areas, like the labyrinthine legal system and attitudes to religion, A Separation really soars thanks to the universal themes and emotions. The family strife and issues faced by the characters are all ones that most people will have experienced, and as they are presented in such organic fashion, it becomes like watching the lives of real people unfurl. Seriously, there were parts when I felt like a fly on the wall of these characters as the script was so natural and true to life, which really earned my admiration. There is definitely drama in the story that A Separation conjures, but the representation emerges as something human and morally complex( particularly in the examination of how our choices can have unforeseen consequences), eschewing any melodrama or unconvincing histrionics for an intimate approach. Hugely benefiting this style is the fact that all the characters are well-developed and each flawed; in this scenario, there is no easy hero or villain, everyone embodies a lot of different things that have large impacts. The film is devoid of music, which puts you right in the middle of all these escalating events without the need for musical manipulation. Instead, your eyes are glued by the significant building of tension that really is done exquisitely. Honestly, if this film wasn’t a drama, it would have made a great thriller due to the unraveling of events and the feeling of not knowing what will happen to stoke the fires of a combustible situation. Many films could learn a lot from A Separation in how to create something naturalistic and authentic. The talented cast is on searing and immense form playing the complex and layered characters we encounter and watch as their lives are changed. Peyman Maadi turns in a layered performance of stubbornness and restlessness as a man who is trying to cope but crumbling on top of everything, even before being drawn into the legal proceedings that implicate him. Leila Hatami is immensely soulful and human as his estranged wife; she is blessed with a face that speaks volumes about the character with just a single glance or expression. There is a stalwart fire that burns inside her as the story progresses and she is forced to become involved. Sareh Bayat is quietly moving as the caregiver whose accusations provide the main catalyst of the story as her feelings are kept so under wraps you aren’t quite sure what to make of her, though you can definitely experience sympathy for her. Her role is probably the most difficult and the one that you constantly find yourself switching between trusting and being wary of. Sarina Farhadi( the daughter of the director) is a marvel for someone of such young years, playing the daughter caught in the middle of everything, mainly the separation of the title between her parents. She projects such emotion and honesty into her role and you really can’t help but empathize with the impossibility of her situation as she loves both her parents. Shahab Hosseini rounds out the cast as the irate husband whose threats escalate in the growing resentment and building hatred between families. I can scarcely think of anything negative to say about the acting because everyone is so realistic and convincing. A deep and thought-provoking movie that questions a lot yet never goes for any easy cop outs, A Separation is a film of the highest quality that really makes an imprint on the audience. 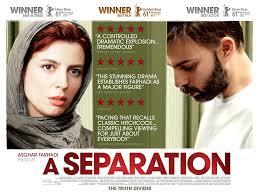 Trust me, if you haven’t watched A Separation yet, you simply must as it is worth your time. Under the Shadow marks the directing debut of Iranian-born Babak Anvari. Drawing on a number of disparate themes and genre tropes, he crafts this eerie horror-drama set in post-revolution, war-torn Iran. Shideh is a mother living in Tehran in the 80’s as conflict continues between Iraq and Iran. She has been trying to regain a place at university, but due to her past involvement in protests during the revolution, she is turned away from studying to become a doctor. Her husband Iraj, who himself is a trained doctor, attempts to support her, but Shideh is hurt by the rejection and lives in fear of the conflict that is engulfing her and her daughter Dorsa. Her refusal to adhere to many things in her culture also marks her as different, especially in the way people around her view her. Soon after being told that she can’t study, Iraj is called up to the military to serve as a doctor in a particularly under attack area. His absence leaves Shideh looking after young Dorsa all alone. Yet events take a significant turn, in between the runs to shelter and Dorsa developing a fever, a missile that doesn’t explode lands in one of the apartments, coinciding with the death of one of the tenants. After this strange incident that particularly shakes Shideh, peculiar events occur for her and Dorsa. The biggest one is people in her apartment building, who all slowly leave for safety, speak of a Djinn; a spirit brought forth by the wind, that can latch onto people, usually through the taking of a personal object. Shideh simply puts this down to just superstition, but after her daughter talks of seeing something that has stolen her precious doll, things start to get unnerving. With both the threat of death looming large due to the seemingly never-ending war and the possible presence of something unnatural, the worn out Shideh is pushed to the limit as she starts to feel more isolated by the day. As Dorsa becomes more feverish and testing, Shideh is left to decipher whether or not the Djinn is real and after her. Most cases seem to point to something amiss after the missile struck, but can she be sure? In a desperate fight and clinging to her sanity, she fights to protect her daughter and figure out just what is going on around her before whatever it is closes her in. Under the Shadow may be his full length feature debut, but there are no first movie nerves shown from Babak Anvari, who also wrote the script. The backdrop of the Iran-Iraq War adds a lot of depth and another example of horror. For all the strange and possibly supernatural things happening, the horror of the everyday and the shock of war are just as realised and plausibly frightening. The most compelling part of Under the Shadow is the ambiguity it has going for it. One can look at the film from multiple angles and interpretations. These appear in both the story and what the film is ultimately about, in terms of genre and thematic value. In one way, the movie could be viewed as a woman’s fears of society shackling her for her free-thinking attitude. Or are these strange events that Shideh thinks are related to the malevolent Djinn, just her feelings of anxiety manifesting onto her young and impressionable daughter? Perhaps the missile that landed in the apartment building did bring something sinister with it. We are never given a definitive answer to these questions, which only deepens the impact of Under the Shadow and leaves the viewer seriously chewing the cud. One of the biggest compliments I can give the movie is that I’m certain it will benefit many viewings, that will no doubt uncover things you may have not noticed the first time around. For me the biggest amount of drama and emotion came from the relationship between mother and daughter. With the obvious stress and terror of the war raging on, tensions run high and Dorsa often clashes with her mother; but there is a deep love there that forms the core of Under the Shadow when it gets into the creepy territory of horror and must fight to save her offspring. There is scarcely a moment of complete silence in this film that enables it to become very chilling extremely quickly. Whether it be the wind wailing, static from the radio or the hum of outside, sound is ever-present and menacing too. There is a definite ghostly hum that simmers away in Under the Shadow to creepy effect, almost from the very start. The acting of Under the Shadow is superb, largely because of how small it is that we get to watch these people act with well-written roles. The striking Narges Rashidi is extremely convincing , resilient and appropriately nuanced as the struggling and free-thinking Shideh, who battles both opposition from others, the terror of war and the prospect of something otherworldly at work. Her face says a thousand things that words can’t and you do feel her struggles in the face of multiple horrors, even when she is being stubborn and get through everything on her own terms that she thinks are the best. Avin Manshadi, as the young girl who appears to have seen the Djinn, is very impressive for someone so young and we want to help her in this time of horror, whatever kind that may be. The bond between the mother and daughter is undoubtedly believable and palpable due to the performances that completely sell their fears and terror in a situation that is unusual and frightening. 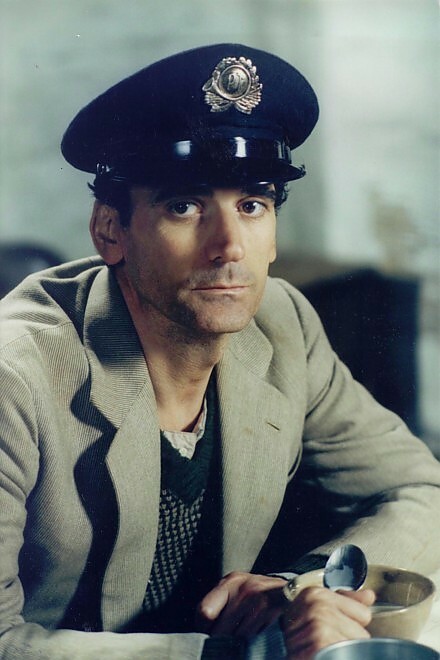 Bobby Naderi appears briefly as the husband who is then called up to be of medial assistance, but he makes his part good for what small material he is given. 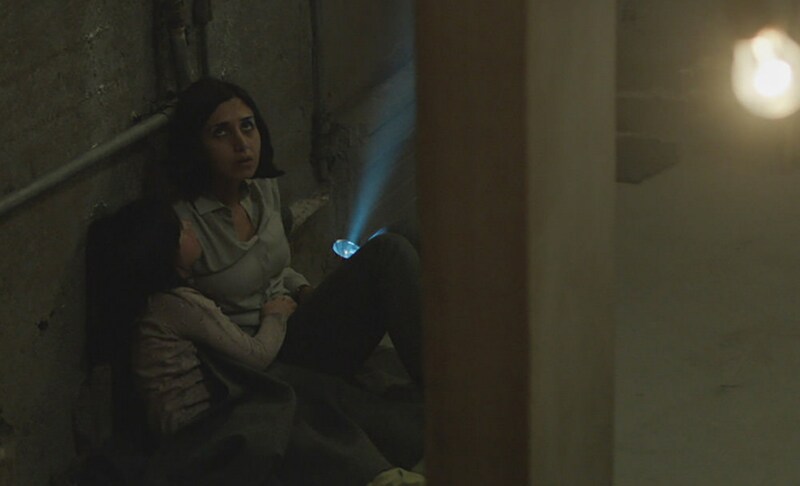 An unusual blend of mother-daughter drama and ghost story, Under the Shadow succeeds on its own spooky and thought-provoking merits, as well as giving us a glimpse of a place and time many of us may be unfamiliar with. 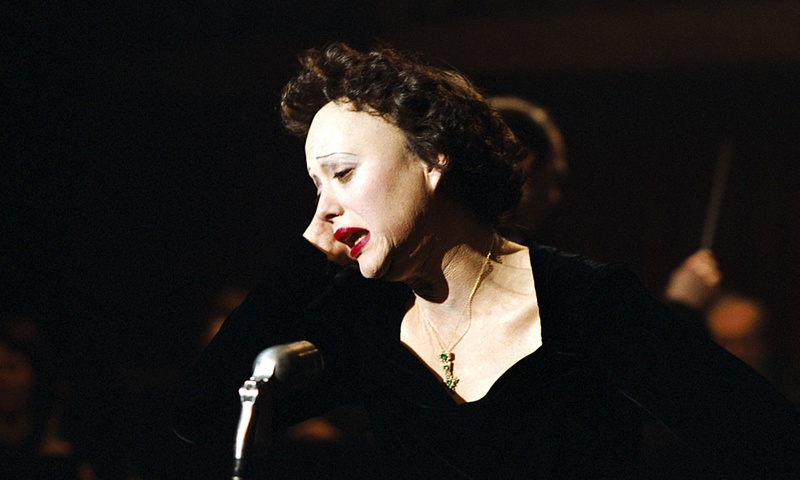 An unconventional biopic of the hugely talented but deeply troubled French singer Édith Piaf, La Vie en Rose is a largely effective rendering of the tragedy she endured. The pace can be a bit off as can the choice to shoot out-of-order at various intervals, yet the fiercely intense and ward-winning work from Marion Cotillard and the handsome design of the piece, more than compensate for these quibbles and foibles to fashion a theatrical experience. It is 1918 when Édith is first glimpsed as a girl living in poverty with her mother, who sings in the street for whatever money she can get. Her mother, wanting to be an artist, abandons her daughter with a relative. The little girl’s father returns from the War and takes Édith with him for a very short time. Her father then drops her off at his mother’s place in Normandy, which is a brothel, so he can go back to the circus. Young Édith is a very sickly child who nearly goes blind due to disease, she regains her sight after a long time of being without the use of her eyes. One of the prostitutes there named Titine, becomes something of a maternal figure and nurses her through these hard times. In later years, her absent father returns and forcibly takes her with him to the circus. Yet this doesn’t last and they are left busking on the streets, which is where the young Édith discovers her talent for singing. As she grows into a young woman, she continues to sing on the street, until one day she is discovered by Louis Leplée, who asks her to perform in his nightclub. She is given the last name Piaf( which in French slang means Little Sparrow) owing to her diminutive stature. Her first stab at stardom is cut short when Leplée is murdered, and it is assumed to be the work of men who Édith unintentionally knows, who are in fact nasty criminals on the side. Temporarily stuck in what to do and besmirched by many, she manages to catch the eye of songwriter , whose rigorous and often brutal training helps her with her perfect what would become her dynamic stage persona. Later with a new manager, Édith eventually hits stardom, though it soon turns out to be something that will lead to her downfall as drug addiction, thwarted love affairs( particularly the one with married boxer Marcel Cerdan) and many moments of tragedy that ruin her already temperamental and brittle mind are inflicted on her. Soon the lively woman is replaced by one that is aged well beyond relatively young years, yet still wanting to project passion. The film is depicted as a reverie of her memories from various parts of her short but eventful life, the structure of the film will be discussed later in this review. Olivier Dahan directs this biopic on the life of the ‘Little Sparrow’ with some interesting ideas and style. While the script takes a bit of getting used to, Dahan and his flair for drama ensure that there is never a dull moment in what is often a moving and painful film. Now the main point of discussion in La Vie en Rose has to be the aforementioned structure of it. The events in life are depicted as a series of vignettes that at first don’t seem to link, but if you look closely actually match up quite a bit. I must say that the nonlinear execution can get quite confusing on occasion and I could have done with a bit more exposition and order, but I understood that the film was eschewing certain tropes of the biopic to conjure up the feeling of her life flashing before her eyes. The feeling of her reflecting on life when she is near the end is backed up by the expressionistic lighting, that mirrors a candle billowing and creating a deep golden colour that could go out any minute. Overall, the representation of her life is complex and sometimes lacks coherence, but still it gets across that she gave so much in her short life, that by the end she had nothing left in her. 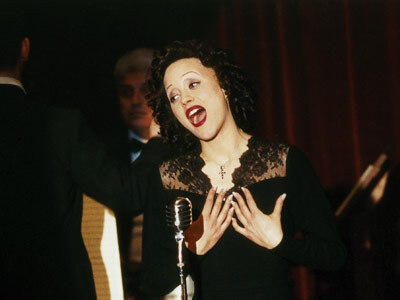 The use of Piaf’s music deserves credit as a lot of it bleeds into the next scene in a most theatrical and melancholy manner. The famous songs of hers, including the title song and ‘Non, Je Ne Regrette Rien’ are all here and performed with emotional clarity. 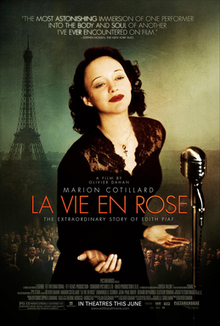 The centre of La Vie en Rose and quote possibly the best thing in the movie is a truly staggering performance from Marion Cotillard, who garnered the Best Actress Oscar for her devastating work playing the iconic Édith Piaf. I can’t think of one thing Cotillard doesn’t put across or express here; there’s the fierce lust for life, tortured frailty, selfish tantrums and deep sadness to be seen throughout. The best way to describe the excellence of Cotillard’s performance is that she doesn’t just play Piaf, she literally lives and breathes this woman with unnerving emotion and realistic conviction. There are moments when you have to pinch yourself that it is Marion Cotillard acting as her work is so convincing and uncanny. Simply put, Marion Cotillard puts in a deep and shattering performance that ensures you won’t ever forget its intensity. Sylvie Testud is pretty good starring as Piaf’s best friend from her youth, who grows distant and resentful of her because of the way she abuses and treats others once she has become a star. I thought Jean-Pierre Martins was well cast as Marcel Cerdan, whose affair with Piaf had a huge impact on her. The scenes he shares with Cotillard are well-played across the board and add to the film. There was a beautiful melancholy and love expressed by Emmanuelle Seigner when portraying the prostitute who became an unlikely figure of motherly love for a very young Édith. 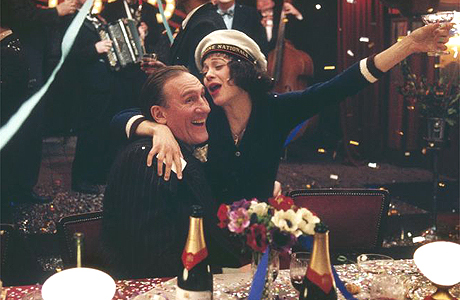 Gérard Depardieu appears in the small but important role of the man who discovered Piaf and he does some good work in the limited time he is allotted. The non chronological narrative may act as more of a hindrance than a help, but as an evocation of the tragic ups and down of life and sensationally played by the wonderful Marion Cotillard, La Vie en Rose shines with moving moments. Despite a few gripes, La Vie en Rose made its mark on me that I don’t believe I’ll forget it in a hurry.